Although without doubt dangerous many people may not include the Saltwater Crocodile (also called salties) on their list of strongest animals on earth. When you think of the strongest animals on earth, you probably imagine a bear or perhaps a tiger. What lands this fearsome reptile on the list is it's incredible bite force; in fact at 3,700 psi (pounds per square inch) its bite is the strongest of any living animal. You will truly appreciate the strength and danger of this croc after reading the lists of interesting information below which is written for both kids and adults. Click here for a great selection of Amazon.com books about Saltwater Crocodiles. The Saltwater Crocodile is the largest extant (living) reptile in the world. Adult males usually weigh between 880 - 2,200 pounds (400 - 1,000 kilograms) but can grow much larger. Their length is usually between 14 and 17 feet (4.3 and 5.2 meters). Females are significantly smaller with an average length of 9.8 feet (3 meters). This reptile is carnivorous and is not a fussy eater. It has been known to attack lions, sharks, water buffalo and basically anything that gets close enough for it to pounce on. 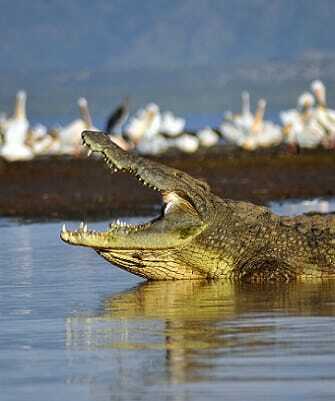 Saltwater Crocodiles prefer to live near coastal regions but are sometimes spotted miles out at sea. They are found from India's coastline down to the northern part of Australia. Although it does live in saltwater, it can also be found in freshwater areas such as swamps, rivers and lagoons. There are several reasons why this reptile is so dangerous to humans; these include their enormous size, strength, and speed. Another factor that makes them very dangerous is that they are ambush predators. Jumping out at prey with lighting speed makes it hard for any animal to escape them. Once the crocodile catches its prey, it is nearly impossible to escape the deadly impact of its powerful locking jaws. The Saltwater Crocodile is most dangerous in the water, after locking its jaws on its prey; the Saltwater Crocodile will usually try to drown its victim by dragging and rolling it (also called a death roll) underwater. Because of the real possibility of kids encountering saltwater crocodiles in Australia, educational programs have been put in place to teach kids who live in close proximity to them about their deadly neighbors. Mating occurs in the water during the wet season but the crocs need dry land, specifically grassy areas by a riverbank, in order to lay their eggs. The incubation period for Saltwater Crocodile eggs is about 12 weeks, during which time the female croc will stand guard and watch over her eggs. During the mating season the males will try to intimidate each other and become very aggressive. They will often fight over territory. With between 40 and 60 eggs laid by the female crocodile, only about 20% of them will hatch. Amazingly only 1% of those will avoid being eaten by other adult males and make it to full maturity.